If you try to fold a hollow article from paper or cardboard (or another easy-to-handle material), you sooner or later come to a point where you can't glue the last two folds. You have a hard time pressing the two pieces together from both sides. One of your finger is inside the article after all. If you are dealing with a simple geometric shape (such as a cube), you are usually able to get the last fold done somehow. But it's much harder with more complex or smaller shapes (such as a complicated rhombus cuboctahedron in a protective cardboard cube). As always, super magnets (Q-05-04-01-G, S-03-01-N or others can help, as long as they are small, with a relatively large magnetised area, and cheap. Just place one of the small magnets at the "critical point" on the last fold inside the article. Fasten the respective area with adhesive and close the article. Then, place a second magnet (or a ferromagnetic object, such as a pen) as a counterpart on the outside and drag it back and forth over the glued part. The magnet presses agains the fold from the inside and ensures good adherance. 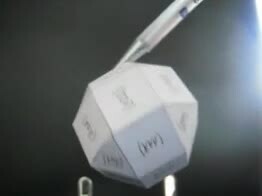 You can't see the magnet inside the shape, but you can see in the video how it is attracted by the pen. Advantage: Even complex geometric articles can be glued together at the end, and the finished product can be attached to the fridge, for instance. For the cardboard box (protective cover for the rhombus cuboctahedron), cube magnets proved to be helpful: They held the glued parts in place, which is practical since the sturdy cardboard is not that easily bent and even glued parts tend to open up again. Thanks to the magnets you have your hands free and can continue your work.